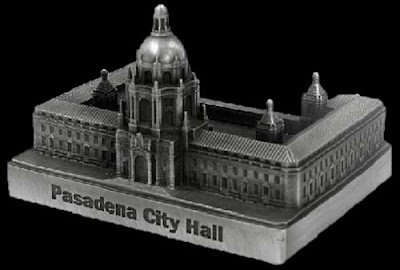 Attendees of this yea’rs SBCS convention will have the opportunity to purchase a special commemorative building replica of the Pasadena City Hall. The hightly-detailed miniature metal building is made by InFocus Tech, who have also produced other replica’s of L.A. buildings including Eastern Columbia, Richfield Building and the Carnation Building to name a few. The real Pasadena City Hall is one of the finest examples of the California Mediterranean style. It is the dominant building in the Pasadena Civic Center, a complex of government, institutional and cultural buildings that epitomizes the City Beautiful movement. Since its opening on December 27, 1927, the Pasadena City Hall has remained one of the most distinctive public buildings in the United States and is listed on the National Register of Historic Places. For the architectural design, the architectural firm of Bakewell and Brown turned to the style of 16th century Italian architect Andrea Palladio, who had studied and admired the Roman architect Vitruvius, as did the California mission-building padres. Palladio represented the simple, serene, classical style of the early Renaissance, in contrast to the Gothic style of medieval times and the rococo style of the later Renaissance. Three famous European domed structures show Palladio’s influence: the church of Santa Maria della Salute in Venice, the Hotel des Invalides in Paris and St. Paul’s Cathedral in London. Without being a direct imitation, Pasadena City Hall is related to them all. Rising 6 stories, city hall contains over 235 rooms and passageways that cover over 170,000 square feet. The defining dome, located above the west entrance, is 26 feet tall and 54 feet in diameter. The City Hall has long been a favorite shooting location for filmmakers. It has also been used as an embassy in the "Mission: Impossible" television series, the Beverly Hills police station in all the "Beverly Hills Cop" movies and a villa in Charlie Chaplin's Oscar-nominated 1940 film "The Great Dictator.